In the 1970s, I visited a Western District drovers’ camp with my father. I remember the weathered stockmen, their battered caravan and wiry dogs. It was not uncommon in those days to drive up behind a mob of sheep being slowly moved along the grassy roadsides. Then, drovers moved stock to find feed when grass was scarce, but in the early years of settlement, the only way to get stock to and from market or from the ports was to use a drover. Known for their hard-drinking and foul mouths they were often away for months at a time. My ggg grandfather James Bishop was of those hardy breed. 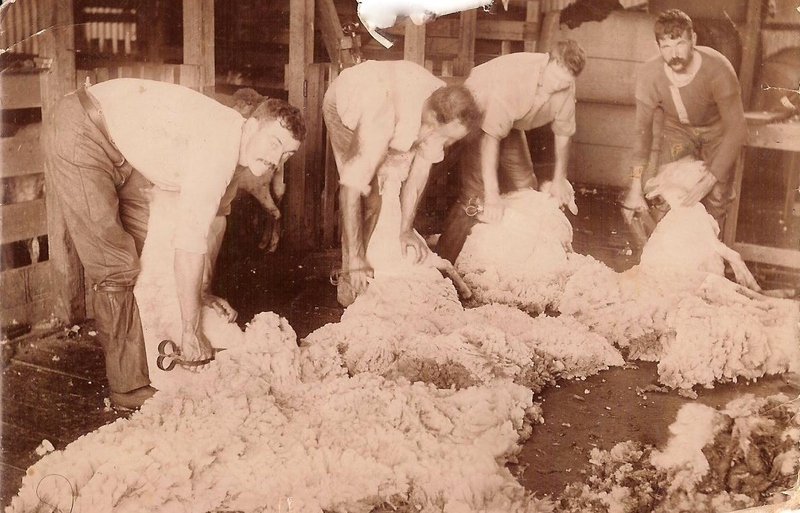 He herded cattle from Adelaide to the Western District and moved sheep for the local stations for around 30 years. Jim was born in Dorset in about 1825. I am still to find how he came to Australia, but I first catch up with him in this country when he married Sarah Hughes on October 26, 1852 at Adelaide. They had one child in Adelaide, Mary Elizabeth, but she died aged two. James and Sarah then moved to Ararat, where James tried his luck on the goldfields. Charles was born in 1856 in Ararat, followed by my gg grandmother Elizabeth on September 12, 1857. Her birth certificate shows James’ occupation as a miner. James and Sarah had one more child at Ararat, George in 1859. Not long after, the Bishops moved back to South Australia with two children born in Mt Gambier. Peter Fraser mentions in Early Byaduk Settlers that James Bishop went to Byaduk around 1865. This is backed by the birth of Mary Bishop at nearby Macarthur in 1865. In 1870, Jim selected 16 acres of land at Warrabkook between Byaduk and Macarthur. Robert, Louisa and Alice were born at Macarthur and William was born at Byaduk. George – Born: 1859 Ararat, Victoria. Died: ? William James – Born 1874 Byaduk, Victoria. Died: ? Peter Fraser tells of Jim droving cattle overland to the Adelaide market and I have found several references to Jim’s droving in The Argus. “Pastoral Intelligence” notes in The Argus updated readers on the weather, crops and stock movements, among other things. Jim is mentioned on August 4, 1890 droving fat cattle from Muntham, between Coleraine and Casterton to Warrnambool. The same article mentions the weather as being very cold with constant heavy rain over the previous 24 hours. Tough conditions for a drover of any age, but at 65 Jim must have found it incredibly tough. A month after the Argus article, Jim’s eldest daughter Lizzie (Elizabeth) died of consumption (TB) aged just 33. Only a year before, daughter Mary also died at age 24. Of 11 children born, Jim had lost three of his daughters. Also, his wife of 33 years, Sarah, died in 1885 at only 51 years. Another daughter, Alice, died before Jim’s own death. Jim just kept droving. In October 1892, he was moving cattle from the property of the Powers at Byaduk to Framlingham near Warrnambool this time in humid conditions. Two months later he was moving heifers during a cold December. The last article I find about Jim is on February 15, 1893. He had taken horses from William Melville’s Weerangourt station at Byaduk through to Ballarat. Jim died just two years later in 1895 at Hamilton, aged 70, leaving behind four sons and three daughters. This entry was posted in Western District History and tagged Bishop, Byaduk, Dancer, Elston, Harman, Hughes, Macarthur. Bookmark the permalink. ← Western District Volcanoes – Are They Sleeping?